Has someone ever thanked you from the bottom of their heart? Before I arrived in Mumias, I would have said yes. That time a friend of mine was down on his luck and I helped him out. The time I placed a player with some physical challenges in goal for our soccer team, told him I believed in him, and watched him play the game of his life—that time his mother thanked me from the bottom of her heart. These moments make you feel great. I beam with pride thinking about them. But nothing I’ve ever done prepared me for what I experienced in Mumias. Habiba Mohamed (Fistula Foundation’s outreach manager for Action on Fistula) and her group WADADIA do beautiful work doing “the hard stuff” of finding fistula sufferers in remote parts of western Kenya. But one refrain you hear over and over in these places is that the work doesn’t end with the fistula repair. These are shattered women, many isolated, abandoned, made to feel worthless, cursed—or perhaps worst of all—a burden. Until you sit and listen to a woman describe her life before and after her fistula repair surgery, you can’t really, truly intellectualize it, right down to that mischievous twinkle in her eye when she says she has a boyfriend again. Many organizations we work with have a philosophy of the soft art and delicate process of resocializing women and getting them re-established in their communities. It is a beautiful thing to witness. But until you sit and listen to a woman describe her life before and after her fistula repair surgery, you can’t really, truly intellectualize it, right down to that mischievous twinkle in her eye when she says she has a boyfriend again. So at the end of my long day with Habiba and her team, they had a final treat in store for me. 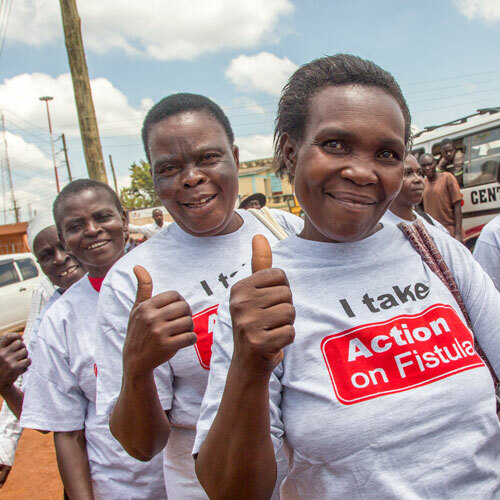 One of WADADIA’s strategies is to place fistula survivors in support groups, which meet frequently and are organized around a skill they have learned through WADADIA. I was getting to sit in and observe one such group’s meeting, held at WADADIA’s offices. Ah, but that’s not what they had in mind. Do you hear those ululations of sheer joy? My hair stands on end just thinking about them. This was a thank you not just to me, but to everyone who has ever contributed to Fistula Foundation. These women have pride and dignity. They are powerful. And you helped them. They are thanking Fistula Foundation and its thousands of supporters for giving them a reason to be joyful again, to feel like women once more. And they’re doing so from the bottom of their hearts. Bill Mann is Fistula Foundation’s board chair. Bill has been passionate about delivering life-changing care to women suffering from obstetric fistula since his first visit to the Addis Ababa Fistula Hospital in 2011. This January, he had a little time to fill, so he booked a plane ticket to visit Fistula Foundation partners in Malawi, Kenya, Madagascar, and Tanzania. See more of his dispatches here.